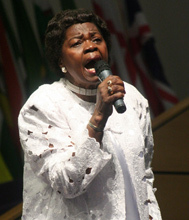 Apostle Eunor Guti has been called by God to various areas of ministry, and has inspired the hearts of thousands worldwide with her gift of Evangelism. In working as a team with her husband Archbishop Dr. Ezekiel Guti, she has led many souls to Jesus Christ, and continues working diligently as an apostle, evangelist, wife, mother, and servant of the Lord. She is a mother, an inspiration to many, and a friend to young people. Apostle Dr Eunor Guti holds a B.A; M.A; and a D.Min from Friends University. She is a recipient of the Esther's Leadership Award from the Third World Leaders Association presented to her by the Honorable Prime Minister of the Bahamas. 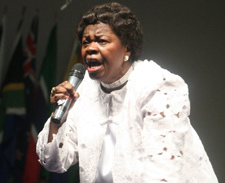 Apostle Eunor Guti is the Director of the Women's Ministry in Forward in Faith Ministries International, and has founded several women’s ministries that have impacted millions including political leaders throughout Africa. She is a great motivator who has inspired intercession groups and spoken in multiple women's conferences, family conventions, youth and leadership seminars all over the world. Along with her credentials and achievements, she is credited as being the first female marriage officer in Zimbabwe, and has made a practical demonstration of how a woman can submit to her husband while remaining a vessel of influence. "Women, you are highly favored of God. Rise up and take your position... not above your husband's head, not under his feet, but side by side with him next to his heart with a sweet spirit. Be outstanding in the things of God..."
Apostle Eunor ministers the word of God with great passion, and in 2005, was commissioned by Archbishop Dr. Ezekiel Guti to lay the foundation of the Good News Deliverance Explo movement. Having a prophetic message for the nations, Apostle Eunor and the Explo team began in Zimbabwe preaching deliverance from darkness to light, poverty to prosperity, ignorance to knowledge, and laziness to diligence. 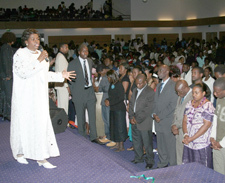 Many people have received their miracles while simply listening to her and other anointed preachers as they minister the word of God. Good News Deliverance Explo is progressing throughout Forward in Faith churches worldwide, with preachers, teachers, and evangelists traveling and taking the message through their cities. 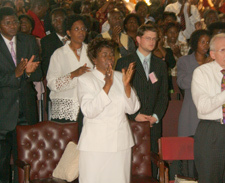 Dr. Eunor preachers the word of God, followed by signs and wonders. Believers and non-believers receive the fire of the Holy Ghost, and miracles are seen. The crippled walk, the blind see, the mute speak, the barren conceive, and those under demonic oppression are set free.